Selection, entry and timing are arranged but how should we proceed once we have the shares? Where or when do I take a profit? How and when do I change the initial stoplosslevel so that my risk is reduced? All of these questions are important because they have a direct impact on your final result. Keeping losses ‘small’ is the most effective way to protect your port. It will also ensure that your final net return is significantly higher! Systematically increasing your stoploss, each time protecting a greater part of your realized profit, is a very effective method. ChartMill has several stop-loss tools for it! 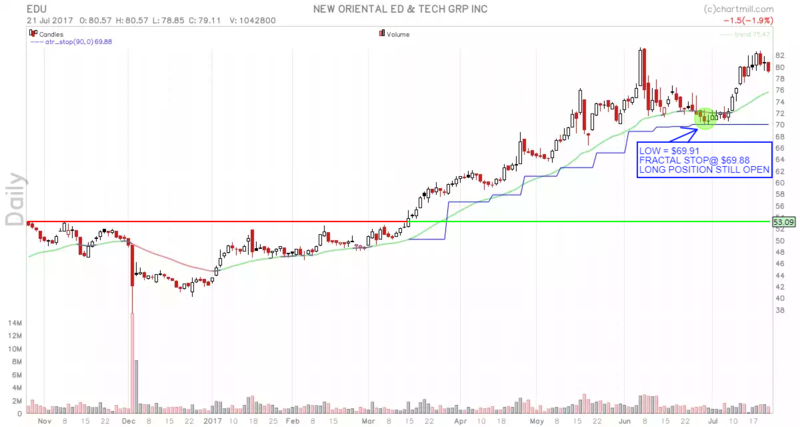 In the example above (New Oriental Ed & Tech Group Inc. (Ticker: EDU), a long position was entered on March 17, 2017 at $55.03, two days earlier the most recent price resistance was broken a first time. 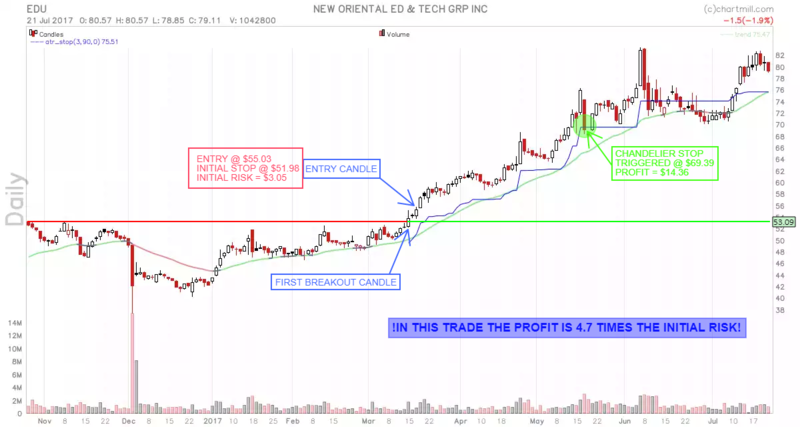 Initial stop-loss was placed below the first breakout candle ($51.98). Then, for the further follow-up of the trade, the ‘Chandelier Exit’ was used, this is a stop-loss based on the ATR (Average True Range) value. That stop loss can – in the case of a long position – only increase with the price but will never fall back in relation to the price. The intention is that the price will be given space and profit will only be cashed when the Chandelier Exit is hit. As noted in the graph above, this ultimately resulted in a profit of $14.36 per share versus a risk of only $3.05 per share. 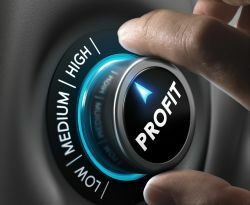 The profit thus amounts to almost 4.7 times the initial risk. In other words, even if you lose four times in a row, that loss is not only completely eliminated if the fifth trade is successful as in this case… but you will end up with a nice profit! Learn more about the Chandelier exit stop in this article. This stop loss follows the share price based on identified swing points. These are temporary small retracements in price, after which the price rises again higher. As soon as this happens, the stop loss will re-position under the last swing point created. Applied to the same graph as above, we get a stop loss evolution as shown below. We notice that using this kind of stop the position would still be open… The current closing price of $79.11 gives us an outstanding profit position of no less than $24.08 per share. Against our initial $3.05 risk, this gives a risk / profit ratio of no less than 1 to near 8. Otherwise, one such winner is enough to make up for 8 previous loss positions! More information about this swingpoint stop strategy can be found here. The two examples above clearly show that the size of your profit and loss positions is much more important than the number of profitable versus losing trades.